Heat oven to 350°F. Line loaf pan, 8 1/2x4 1/2 inches, with alumnium foil. Sprinkle parsley in bottom of pan. Remove fat from chicken. Cut chicken into 1-inch pieces. Place chicken in food processor. Cover and process until coarsely ground. Add remaining ingredients except bell pepper. Cover and process until smooth. Mix chicken mixture and bell pepper. Spread in pan. Cover pan tightly with aluminum foil. Bake 1 hour; remove foil. Bake uncovered 20 to 30 minutes longer or until meat thermometer inserted in center reads 180° F. Cover and let stand 1 hour. Refrigerate at least 3 hours but no longer than 48 hours. Invert onto serving platter. Remove pan and foil. 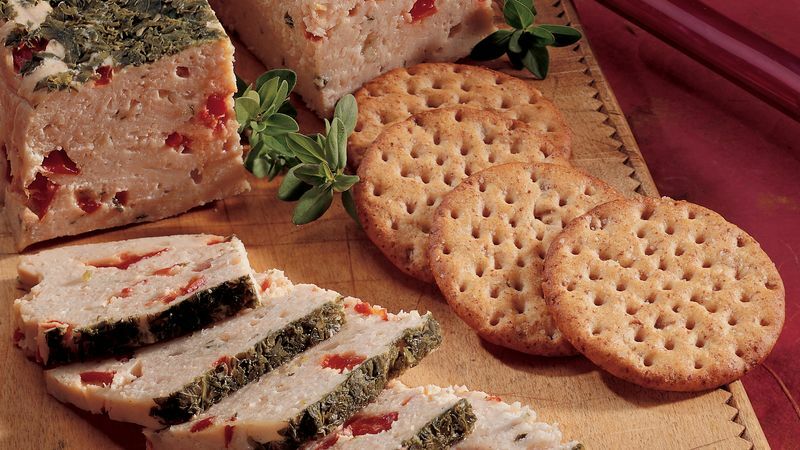 This impressive appetizer can be made 2 days ahead, then tightly covered and refrigerated. Serve this elegant pâté with an assortment of thin gourmet crackers, or cut the terrine into 1/2-inch slices and serve topped with a dollop of a purchased herb dip as a first course.